Today we will retake you to the basics of SEO! Title tags are an on-page factor that influences SEO on a high scale. It is the second most important SEO ranking factor. Whenever you search for a query in the search engine, it Indexes relevant data according to its algorithm. 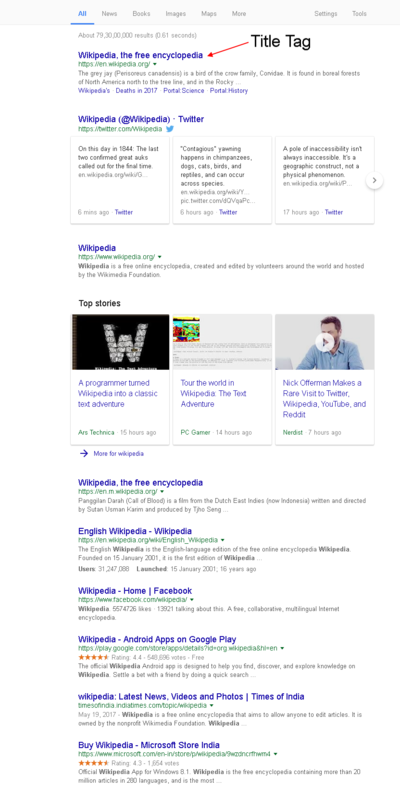 You can see a bold blue text written that gives you a gist of all the website which is indexed by the Search Engine. In other words, title tags are HTML elements( clickable) that are used to explain search engines and visitors about the content of a web page. Title Tag is a unique identity of all your web pages. The power of Title Tag in SEO? Title tags are a part of On-page SEO and have constantly been one of the single most important ranking factors before search engine algorithms increased their complexity by including other ranking factors like link data, social media interaction and traffic/performance metrics. It helps search engine to understand what your page is all about and creates a first impression on visitors. Thus title tags hold a higher value for on page optimisation. Title Tag is visible in two key places. Web browser: Title Tags are illustrated on the internet browser and act as a placeholder when there are many tabs opened at one go. It helps people to navigate easily. Whenever you share a website link on social media, the post automatically fetches the title tag written on the web page. Whenever we start an SEO audit for a website, we primarily look at the title tags on the website because when a user searches for anything on Google, they first interact with the title tags. It is a good place to manifest what type of content is holding inside your website. Search engines depend on the Title Tags to fetch relevant data. Crafting an influential title tag becomes an art and science because both human and Search Engines need title tag to understand your website; you have to write title tags that are lucid for both. A properly framed title tag without any keywords will not help you to rank anywhere(except when your brand name is searched). Keywords are the most important element of SEO & using them in title tags will explain users the type of services or products you sell online. The user search strings are matched to the keywords used in your title tag. The thumb rule for writing an excellent title is to use your primary keywords at the beginning of your title tags. A study shows that Title that starts with the targeted keyword performs 80% better in Google, as compared to the titles which don’t. Search engines have set a standard length for title tags. The length of a title should not be up to 60 characters, titles exceeding the limit ends with ellipses (…) indicates that the title is still an endless sentence and provides an incomplete information to the users and the probability of clicking the link by the user can get affected. While writing meta tags, it is better to get sure about the title length. Moz provides title tag preview tool that allows you to preview exactly how your title tag will appear on Google search page. Every page on a website has a unique content depicting about the brand services. Crafting unique title tags for each page will help the search engine to understand what your page is all about. It will help the robots to crawl & index relevant content from your web page. With this technique, each page on the web has a higher chance of ranking better in SERP. Along with title uniqueness; an ideal practice is to include special characters in title tags. Using special characters is recommended because in the clutter search result it can catch the eyes of web user and attract them to click the web page. Using numbers & special characters help you rank on Top. Brands like Amazon use their name to attract and maintain the trust among their users. While Title Tags is an important SEO factor, our core objective of writing a title tag is to attract the users to the website by providing a useful and relevant information within a given character limited. Keyword stuffing in a title tag will not help your user to understand what exactly you are serving them. Title Tag has always been a powerful SEO influencer. An enticing title can help you to rank faster and get relevant traffic to the website. Following is a good example of title tag with perfectly used keywords, special characters and brand name. There are many factors that might or might not affect your ranking but title tags can definitely help you to stand out in SERP and increase your CTR. Ignoring meta title optimisation will be a big mistake and might adversely r impact your SEO efforts. Previous PostPrevious Can Country Code Domain Limit Your Global Ranking? Next PostNext Meta Description Tag: Everything You Should Know!